On a hot June morning I hid in the basement TV room, away from my husband, my stepchildren, and my visiting father-in-law, to finish a book proposal. I possessed a business card from an agent who liked my brief in-person pitch and asked me to keep in touch. I was eight months pregnant and determined to send her an email before the baby arrived. I knew this ambition was crazy. I knew the arrival of the baby was going to rearrange everything. But I couldn't let it go. I was desperate to have my next writing goal set on the horizon before a newborn tipped my brain, my body, and my desk upside down. My water broke the next morning, and 21 hours later my son arrived, 3 weeks early. 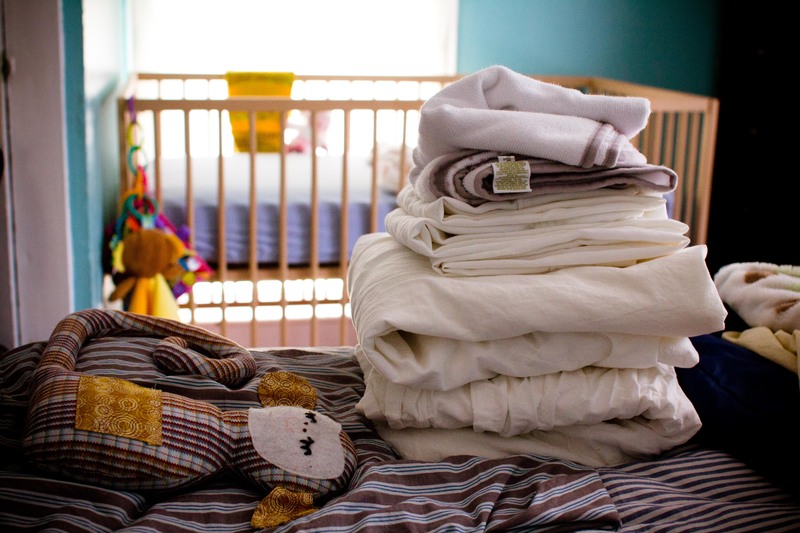 With a new baby in the house, the discipline and organization I had relied on for a lifetime were useless. Love for my son and the details of his care consumed me. At the same time, my mind paced around the unfinished proposal like a dog on the wrong side of the door. I kept trying to organize the baby's needs, my own hands, and the hours in the day so I could sit at a computer and type out words. But my hands were never free. I was utterly occupied, as I swaddled the baby into green polka dot cloth diapers, as my hands swished him in the soapy water of the sink and wrapped him in tiny giraffe pajamas, as I snapped him into his car seat and clenched the steering wheel on the way to the supermarket. Free time, my husband quipped, could only be seen in hindsight, once the unexpected nap had passed or the helpful friend had gone home. My mind chewed on the book proposal like a straw in an empty glass. I had written a book once before, about music and end-of-life care, so I could picture exactly what I needed: a chunk of time, a rested mind, and two hands. But I could never quite gather those things together. When I wrote the first book I was single and had decadent resources like a home office and silence. Weekend hours could be strung together, one after the other, like handmade glass beads. My biggest distraction was browsing through online dating profiles when I was supposed to be writing, a problem that I could solve by turning off the wireless router. Now the distractions were innumerable, and I could turn none of them off. My best superpowers—willpower and determination—disappeared and were replaced with new ones. I lost my ability to solve any problem by shoving my shoulder against it, but now I could magically wake up a few minutes before the baby started crying. I couldn't finish a to-do list, but I could smell a rotten banana from two rooms away. I could not hold a thought from the top of the stairs to the bottom, but I could soothe the baby with a gentle sway and a few lines from the Paul Simon songbook. "It goes by so fast," says every stranger to every person with a baby. "Enjoy it. I miss it so much." I believe them. Now that my son's two years old, I miss his infant squawking and his funky crawl. But doesn't everyone's life go by so fast? Why do we only point this out to parents? Shouldn't we be saying this to each other, any time we can? If you want to open an Italian restaurant, reconnect with your middle school sweetheart, learn to play the oboe, you'd better get started. And enjoy it. You'll miss it so much when it's gone. So much has already gone by so fast. Now that I am old enough to look back over 20 years of choices, I regret the time I did not dedicate to writing, the MFA in poetry I did not get. Ten years ago, a boyfriend offered to pay the rent so I could write. Instead, I got a temp job in an HR office, processing pay increases for truck drivers. I can see the line of teachers, going back to elementary school, who urged me to take writing seriously. An English teacher once revealed she wrote lesson plans with me in mind. My high school creative writing teacher drove me from the suburbs into Boston for concerts and readings. One night, she introduced me to the featured poet and asked for feedback on one of my poems. In college, an English professor invited me to meet a visiting writer and urged me to speak up. Looking back, I see how hard they tried. I am appalled I did not notice or accept the help these mentors offered. But I didn't understand what they were saying. I thought writing was a hobby, like playing piano or keeping up my Spanish after college, and I wanted to do work that would help people. I didn't know choosing to make art is one of the hidden definitions of helping people. It's not just that art can comfort the weary, heal the sick, and change the political face of the world. But it's also the artists themselves, showing up for the joy and terror of the creative process. The courage to be oneself, and to carry on doing one's true work, helps people every day. I was in my early thirties when I began committing myself to writing. When I was writing the book about music and end-of-life care, I felt I was finally walking around in shoes that fit, instead of pinching myself into roles that weren't quite right. Moving letters and words on a page, finishing interviews and their endless transcriptions, fussing over small points in my arguments, I felt I was waking up inside my life, among the marked-up pages on my dining room table. I had a full-time job. It was satisfying to have a professional life and an artistic life. I had health insurance, a corporate credit card, and a book contract. Who could want more? When my book came out, my friends threw a party at work. My boss bought champagne and a cake that read, "You Wrote a Book!" I sold books and signed my name on the title page, just like a real author. The book was published on paper, on Kindle, and in Japanese. It quietly sits on library shelves around the world, waiting for its next reader. Once or twice a month someone buys it on Amazon. There was no book tour or call from Oprah. But I have not gotten over my astonishment at bringing a new book into the world. My only goal since then has been to find a way to do it again. Once my son was born and my maternity leave ended, the romance of having a separate artist's life ended too. I pumped milk in my office three times a day and came home to relieve my husband, who was home with the baby full time. I put the baby to bed, cleaned the kitchen, and sterilized the bottles for the next day. It slowly dawned on me that one day this child would form an opinion about my life. People would ask him what I did for a living, and he would have something to say. Mom wanted to be a writer, but she always had other jobs instead. Or, my mother wrote a book a long time ago before I was born. She said she wanted to do it again, but she never did. Or worst of all, no mention of writing at all. When I was 40 and my son was 1, I realized I did not have the fortitude to have a full-time job, a family, and a writing life. The only solution I could think of was to make my writing life into my job. Because of my history of veering away from writing and accidentally ignoring the people who were trying to help me, I knew I needed structure after I left my job. Once a week, my husband and I sat down with the calendar and split up our son's daily childcare so we could predict and plan our work time. As my son approached his second birthday and we moved out of the fog of caring for an infant, some of my discipline returned. I decided to become someone who wrote every day, instead of waiting for a block of time, a special fountain pen, and an office with a view of the sea. I also decided to use a mantra I made up when I first started going to the gym: Everything counts. Ten minutes or two hours, a journal entry or a book chapter, it didn't matter. Write every day. Everything counts. I wanted to meet people capable of saying "freelance writer" without a question mark at the end of the sentence, so I signed up for a magazine writing class. I learned how to write a pitch letter and an opinion piece. By the end of the semester, I had a supportive email from a magazine editor, a few ideas for stories, and a new friendship with a classmate with young children. Best of all, I found a group of colleagues. I reached out to a few friends, all talented writers trying to balance jobs, writing, and life with small children. I invited them to form a low-key writing group. They all said yes. The group does not do much. We don't read each other's writing. We don't offer edits or critique. Sometimes we drop out of contact for weeks, or even a few months. The only way I know they are publishing is that I follow them on social media. The only thing we do is exchange occasional, brief emails about the writing process. As little as we do, this group has given me ground to stand on as I move writing to the center of my life. They connect me to a larger world of parents who are writers, who grapple with the opposing forces that pull us toward our children and family life, and also toward our work. When I sit down during my son's nap or early in the morning, I know they are out there, procrastinating with odd chores, worrying over deadlines, collecting rejection letters. Because I admire them so much, my desire to spend my time this way feels less crazy with them listening in. We can write. That's what this little group tells me, even in total silence. And we may as well. The time goes by so fast. The book proposal continues to call to me. The agent's business card is tacked up on the wall of my old office, now my son's bedroom. It waits for me between decals of a blue elephant and a yellow monkey. The book is about finding my husband and stepchildren through online dating. I wrote my first Internet dating profile in 2003, before Facebook, smartphones, and texting. I've been thinking about this proposal for so long that when I edit my oldest essays, I notice how much the vocabulary has changed. "One man posted a profile photo of his bare chest taken in his bathroom mirror with his camera" recently became, "His profile had a selfie of his chest." When I accepted a part-time consultant position in my old office last fall, I made a deal with myself. I would finally write a first draft of the book. Seventy thousand words by Thanksgiving. I did it using my two guidelines: Write every day. Everything counts. One of the members of my writing group joined me. This spring I am taking another class, on writing a nonfiction book. For my son's third birthday this summer, I plan to give us both a present, a finished book proposal. And if I'm feeling very brave, I may even take the agent's card down from the wall and tell her about it. Jennifer L. Hollis is a writer and music-thanatologist in Somerville, MA. She has a master of divinity from Harvard Divinity School and is the author of Music at the End of Life: Easing the Pain and Preparing the Passage (Praeger Publications, 2010). Her work has appeared in the Christian Century and Word Riot. You can connect with her at www.jenniferhollis.com. Jennifer, the timing of reading this for me is so exquisite, in ways you never could have known. Thank you for sharing your story here. For writing everyday. "Everything counts" is one of my life-line mantras, and you bring it to life so beautifully here. "Everything counts." What a reassuring sentence. Thank you for writing and sharing this. I love this Jennifer and can relate to your story. I feel like I may have squandered years not writing, procrastinating, working jobs that I didn't love - and then having 2 babies - but now I'm back and making writing my priority, because it's always been one in my heart. "Everything counts" is an awesome mantra. Thank you for this, and good luck with your book proposal. Thanks for sharing your story. Before my son was born, I made a list of things I wanted to do before he "took over" my life. I did indeed do those things, but my list had changed after his birth and the birth of my daughter. You are blessed that you know what you want to accomplish!! Love to read your story!